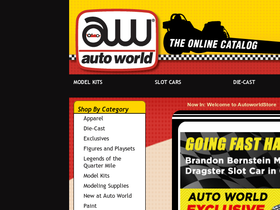 Auto World Store, online at autoworldstore.com, is the destination for model cars and automotive hobby supplies. Auto World Store offers a great selection model kits, including aircraft model kits, car model kits, plastic model kits, Batman model kits, sci-fi and Startrek model kits, pinewood car kits, and much more. Auto World Store carries die-cast models, figures and playsets, posters, slot cars, gas powered cars, hobby tools and paints, and other items to add to your collection. But before you shop, get all the latest autoworldstore.com discounts, Auto World Store promotions, and Auto World Store coupon codes found here at RetailSteal.com. Auto World Store ships within the United States and Canada. See site for more information. Enjoy savings up to 65% on the latest web specials from Auto World Store. Click link to shop. Enjoy free shipping from Auto World Store with your purchase $99+. Click link to shop. Save up to 62% on model cars on sale at Auto World Store. Click link to save on great selection. Auto World Store offers a selection of model kits, starting from only $4. Click here to shop and save. Get a free 2015-2016 Auto World Catalog with every purchase at Auto World Store. Shop today and enjoy. Shop for die-cast model cars starting from $5.99 at autoworldstore.com. Click link to shop. Shop for Three Stooges model kits, starting from only $11 from Auto World Store. Click link to shop and save. Get the Dukes of Hazard model kit bundle for $50 from Auto World Store. Click here to shop and save. Shop at autoworldstore.com and purchase the new 2015-2016 Auto World catalog for only $5.